﻿ PromoBaby.pl - Pampers Active Baby-Dry rozmiar 5 (Junior), 42szt. Pampers Active Baby-Dry rozmiar 5 (Junior), 42szt. 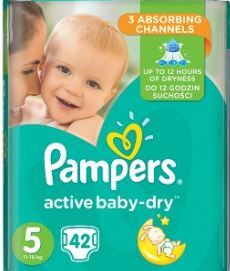 Pampers Active Baby-Dry rozmiar 5 (Junior), 42szt., 35,99zł/opak.